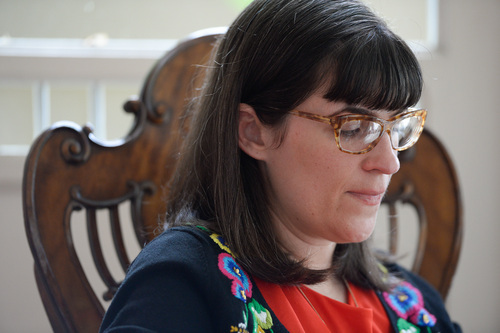 Religion • Ordain Women founder urges other Latter-day Saints to stick with the faith. Francisco Kjolseth | The Salt Lake Tribune Kate Kelly, founder of Ordain Women, checks messages of support and requests for interviews during a quiet moment at a bed and breakfast near downtown Salt Lake City after getting an official message through email that she has been excommunicated from The Church of Jesus Christ of Latter-day Saints on Monday, June 23, 2014. 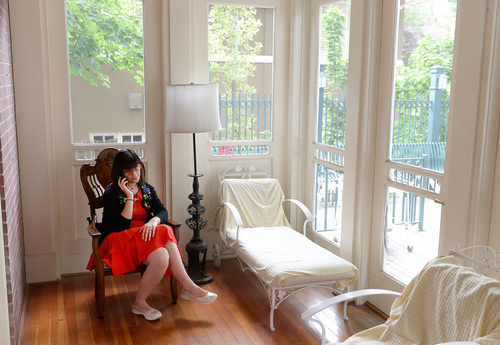 Francisco Kjolseth | The Salt Lake Tribune Kate Kelly, founder of Ordain Women, checks messages of support and requests for interviews during a quiet moment at a bed and breakfast near downtown Salt Lake City after getting an official message through email that she has been excommunicated from The Church of Jesus Christ of Latter-day Saints on Monday, June 23, 2014. Francisco Kjolseth | The Salt Lake Tribune Kate Kelly, founder of Ordain Women, checks messages of support and requests for interviews during a quiet moment at a bed and breakfast near downtown Salt Lake City after getting an official message through email that she has been excommunicated from The Church of Jesus Christ of Latter-day Saints on Monday, June 23, 2014. Francisco Kjolseth | The Salt Lake Tribune Kate Kelly, founder of Ordain Women, checks messages of support and requests for interviews during a quiet moment at a bed and breakfast near downtown Salt Lake City after getting an official message through email that she has been excommunicated from The Church of Jesus Christ of Latter-day Saints on Monday, June 23, 2014. Francisco Kjolseth | The Salt Lake Tribune Kate Kelly, founder of Ordain Women, checks messages of support and requests for interviews during a quiet moment at a bed and breakfast near downtown Salt Lake City after getting an official message through email that she has been excommunicated from The Church of Jesus Christ of Latter-day Saints on Monday, June 23, 2014. 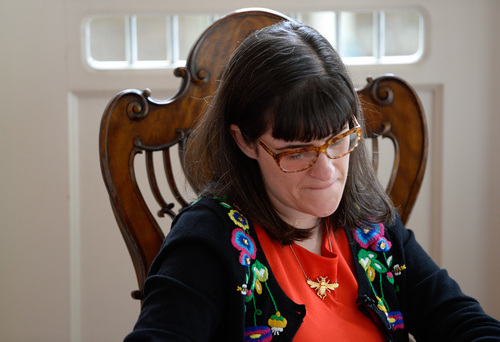 Women&apos;s ordination advocate Kate Kelly said it&apos;s unlikely she will seek rebaptism anytime soon into the LDS Church, which excommunicated her Monday. "I&apos;ve done nothing wrong and have nothing to repent," Kelly said in an interview. "Once the church changes to be a more inclusive place and once women are ordained, that&apos;s a place I&apos;d feel welcome." The decision by a Mormon bishop&apos;s council in Virginia to excommunicate her for "conduct contrary to the laws and order of the church" stunned Kelly, she said. The word "apostasy" does not appear in the letter her Vienna Ward bishop, Mark Harrison, emailed to her, although it was the charge lodged against Kelly when he called for Sunday&apos;s disciplinary council. "I honestly thought until the very last minute that they would do the right thing," the Ordain Women founder said Monday evening. "It feels very much like a forced amnesia, where everything you thought you knew was gone and everything you thought you were isn&apos;t the case anymore." Nonetheless, she encouraged her supporters to stay in The Church of Jesus Christ of Latter-day Saints. "I love the gospel and the courage of its people," she said in a statement. "Don&apos;t leave. Stay, and make things better." Kelly vowed to remain active in Ordain Women and on its executive board. In his letter Monday to Kelly, Harrison said it had been his greatest desire to persuade Kelly to "desist from the course on which you have embarked" to keep her in the faith and to protect the "integrity of the church and its doctrine." "The difficulty, Sister Kelly, is not that you say you have questions or even that you believe that women should receive the priesthood. The problem is that you have persisted in an aggressive effort to persuade other church members to your point of view and that your course of action has threatened to erode the faith of others," Harrison wrote. "You are entitled to your views, but you are not entitled to promote them and proselyte others to them while remaining in full fellowship in the church." The Utah-based LDS Church, when asked for comment, referred to Harrison&apos;s letter, which was made public by Ordain Women, the group Kelly formed in spring 2013. Kelly said she likely will appeal her excommunication, but will try to take her case directly to the church&apos;s governing First Presidency. Church protocol calls for her to appealto the president of the stake (region) where she was disciplined. That stake president, Scott Wheatley, was the one who put Kelly on "informal probation" in May, urging her to take down the Ordain Women website and disassociate from the group. She said her conscience would not allow that, prompting Harrison to call for the disciplinary council. Instead, she submitted a letter with pictures describing her history as a Mormon and declaring her love for the religion. She included a legal brief arguing against the charge of apostasy and messages from more than 1,000 supporters. On Monday, Ordain Women spokeswoman Debra Jenson said the organization is considering its next steps. "Nothing is off the table," she said, and the group will "remain committed to faith-affirming action." However, she said, the organization soon will launch the final segment in its series of six discussions  online conversations that Kelly&apos;s bishop clearly finds problematic. Ordain Women&apos;s six discussions, he said in the excommunication letter, "were intended to proselyte others and to persuade them to support your particular interpretation of church doctrine." Jenson said no organizers have quit Ordain Women. "We have the same board, the same leadership group." If anything, Kelly&apos;s punishment has rallied more backers, she said, noting that the number of people posting profiles on OrdainWomen.org has been rising. In his letter of excommunication, Harrison spelled out the consequences of excommunication and the conditions Kelly would have to meet should she want to be rebaptized. "You may not wear temple garments or contribute tithes and offerings. You may not take the sacrament, hold a church calling, give a talk in church, offer a public prayer in behalf of the class or congregation in a church meeting, or vote in the sustaining of church officers. These conditions almost always last at least one year. If you show true repentance and satisfy the conditions imposed below while you are no longer a member, you may be readmitted by baptism and confirmation," the letter said. "In order to be considered for readmission to the church, you will need to demonstrate over a period of time that you have stopped teachings and actions that undermine the church, its leaders, and the doctrine of the priesthood. You must be truthful in your communications with others regarding matters that involve your priesthood leaders, including the administration of church discipline, and you must stop trying to gain a following for yourself or your cause and taking actions that could lead others away from the church." The letter countered Kelly&apos;s contention that her bishop and stake president had not responded to her repeated overtures to have a conversation about her Ordain Women activities. It mentions a meeting of the three of them in December, which Kelly had acknowledged and blogged about, concluding that she and her lay leaders had agreed to disagree. Her bishop&apos;s letter Monday, however, said he and the stake president "urged you to dissociate yourself from Ordain Women and to cease your campaign to promote the ordination of women." The letter also said Wheatley reminded Kelly of that same counsel again in March and April. Kelly said such conversations never happened. "It&apos;s just not true. Point out the emails. I have all my phone records. There aren&apos;t any [communications]." D. Michael Quinn, a historian who was excommunicated in 1993, said his case was similar in one way: He was accused of apostasy related to his writings and interviews, but was ousted for conduct unbecoming a member. He suspected at the time that his disciplinary council settled on such language because it was easier to get a unanimous decision on "bad manners" than on apostasy. Neylan McBaine, founder of the Mormon Women Project, found a "glimmer of hope" in the language Kelly&apos;s bishop used in excommunicating Kelly. Though an LDS feminist, McBaine has not endorsed the Ordain Women movement. "By not using the word apostasy, it focuses the discipline on her tactics and leaves the door open for the subject matter conversation [women&apos;s role in Mormonism] to continue." She fears the conversation is so polarized, some will take Kelly&apos;s excommunication as a signal that Mormons shouldn&apos;t discuss women&apos;s concerns and those feeling disenfranchised then will embrace the Ordain Women movement. "It&apos;s going to take a very sophisticated and nuanced member to understand the distinction" between excommunication for apostasy and for conduct, she said. "But I hope our membership is compassionate and interested enough that it will be fully engaged going forward." Kristine Haglund, editor of Dialogue: A Journal of Mormon Thought, said on Monday&apos;s Trib Talk that Ordain Women&apos;s activism has created more polarization. And yet the group&apos;s push for women&apos;s ordination to the all-male LDS priesthood is a logical outgrowth of feminism in the faith, she said. Women have been talking for decades about the right to discuss the denomination&apos;s belief in a Heavenly Mother and gender roles. "Kate sort of pitched the hardest nut to crack," she said. The fact is, Haglund added, there has never been an approved venue or tone for Mormon women to speak about their issues with leaders. "And, as Mormon feminists have discovered over the decades, ... the church responds to bad PR. No matter how politely we&apos;d like to speak, there is no way to do so." Natasha Helfer Parker, who writes The Mormon Therapist blog and also appeared on Trib Talk, said she didn&apos;t see Ordain Women as recruiting Mormons to a viewpoint as much as inviting them to think. "I came across it [the group&apos;s website]," she said, "and it resonated." It&apos;s not true, Parker added, that all Mormons feel comfortable or are having discussions about women&apos;s roles in their chapels, in women&apos;s Relief Society classes and other meetings. "People are hurting in ways I don&apos;t think we necessarily are hearing or validating."